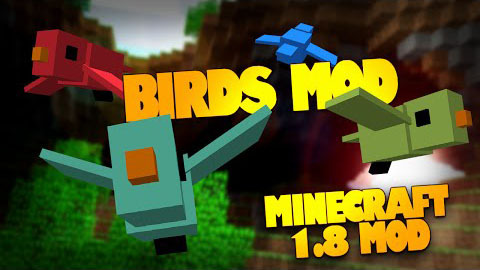 Birds Mod is just a simple mod that adds new bird to Minecraft but it can make you feel more excited while playing the game. These birds are harmless, but they imitate sounds and can scare you with explosions and monster noises. But they also can be bred with melon seeds and can be cute pets, since each of them has its own collection of sounds. 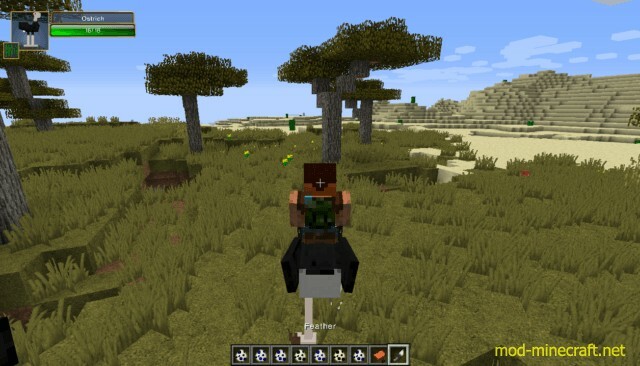 These are useful farm animals in savanna biomes. They drop feathers, leather and meat, and they can be ridden (you need a saddle, for now, but I may change that in the future)! They even duck, so you can shoot with bows better! But they also defend themselves against monsters and players, so do not make them angry. They rarely drop ostrich eggs, which can be used to breed new ostriches and also let some feathers lying around. They like bread, wheat and straw and can be healed by feeding them with it. These birds are dangerous, but as long as you are healthy, they can be scared away easily. But be cautious when you are weak. They will sense weakness and try to kill you when you least need it! They do not do much damage, but their dirty beaks can infect you with poison or weakness. Also, they love to pick up all meat they find and may loot you clean. These cute little birds live in the cold regions and if you are heartless or hungry enough to kill them, they are a great source of food, since they can drop up to three pieces of wild bird meat. They love fish! These small little fellows live in forests and sing all day long. You cannot do much with them, but listen and feed them with breadcrumbs. These birds live on beaches and oceans and might drop fish. They love breadcrumbs and I hope to let them catch fish from the ocean surface. These little birds spawn in the night in dense biomes and mainly run away. They are shy creatures and try to avoid sunlight, but if you are careful, you can feed them with breadcrumbs or melon seeds or breed them as a food source with any kind of seeds. They sometimes even drop melon pieces.